One of the primary reasons for installing a fence around your home is security from property intrusion. However, is your fence also secure against natural disasters? A major risk facing many homeowners across the United States are wildfires, especially in high risk areas such as California where 8,527 fires burned a combined area of 1,893,913 acres in 2018. The National Interagency Fire Center reported that the U.S. suffered 58,083 wildfires nationwide in 2018, burning roughly 8.8 million acres in various areas of the country. The fence you choose to secure your home with will either protect or endanger your property. A fire resistant fence can slow damage from a wildfire, while a non-resistant fence can act as a fire igniter driving a fire directly to other structures, such as homes, on a property. Therefore, as part of a property protection plan, paying attention to fire ratings for fencing materials is crucial. Trex Seclusions Fencing was rated with a Flame Spread Index Average rating of 75, placing it in the Class B category (read more in the Trex Flame Spread Bulletin). This means the risk of a fire spreading rapidly is reduced compared to traditional wood fencing. Dense suburban communities that border natural lands where high levels of inflammable materials such as drought-stricken grasses and brush create a concentrated area with elevated risk. A slower flame spread allows property owners at an individual level to prepare for protection or evacuation. On a larger scale, it also allows communities to be in a better position of responsive action such as allowing authorities to get resources to a fire with enough time to mobilize a defense. For fire prone areas, Trex Fencing provides better protection than wood. While you are upgrading your property to replace damaged fencing or you are building a new fence with future preparedness in mind, include Trex Fencing in your plan. Please give us a call at 1-877-700-8739 or email us at [email protected] to learn how you can best protect your property with Trex Fencing. Trex is coming to Indianapolis! The 2019 Fencetech will be held in Indianapolis, IN with vendor booths on display March 15-16. Come visit Trex Fencing National Distribution Partner, FDS Fence Distributors, in Booth #2446. Meet our product experts, view product samples, and learn how to set up direct purchasing. FENCETECH features a number of events during the show for networking, education sessions, and professional development opportunities. We look forward to seeing you at our booth between sessions. Don’t forget to check out our Installation Videos! Sitting in the Northwest of Wyoming is a hidden gem, Cody. Cody is a small, but historically rich, town, known primarily as part of the Buffalo Bill Center of the West. Cody has a variety of different museums and is located near the historic simulation town of Old Trail Town, where you can step back in time and explore city life in the wild west. Amidst a town that focuses so much on its historical aesthetic, one homeowner is looking for ways to stand out. The goal was to create a privacy screen for the house side porch, but one that wouldn’t detract from the view either. Additionally, the owners loved the look and feel of the Horizons Fence System, and wanted it incorporated into the design. Trex experts at FDS Fence Distributors began brainstorming and designed a unique privacy screen option they believed the homeowners would love. Using the Horizons Fence System, as the owners had requested, the privacy screen was installed by a local installation company to include a 4 ft tall Trex fence followed by a window-like opening, topped by an additional 1 ft. fence. The screen allows for the homeowners to enjoy privacy on their porch while still enjoying the view of the surrounding area. Beyond aesthetics, this Trex screen offers added benefit against the weather conditions in Cody. With frequent windy conditions, a durable and wind resistant material would be essential. Luckily, Trex passes these requirements with flying colors making with a wind resistance capable of withstanding speed up to 110 mph. Overall, this unique screen will not only grant privacy, but will also withstand any harsh weather for the homeowners they enjoy quality time on their porch. If you’re looking for a city full of good food, entertainment, and history, then Louisville, Kentucky is the place for you. Among all the sources of entertainment you can find in Louisville, Derby City Gaming is a popular destination. Derby City features live music, food, as well as a casino area. Derby City is owned and operated by Churchill Downs Incorporated (CDI). CDI is best known for its horse races. CDI’s practice track for its horses is located nearby Derby City. Trex Fencing-FDS Fence Distributors supplied Myers Fence, of Nicholasville, Kentucky, with 1,750 ft. of Trex Seclusions Fence for the Derby City casino property. 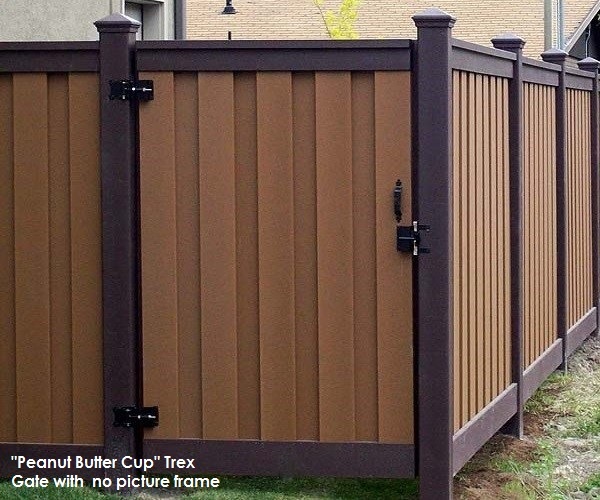 The Trex Fence is 8 ft. tall and features the shade, Woodland Brown. The project required a cantilever gate with a 16 ft. opening. A cantilever gate slides behind adjacent fencing, rather than opening in a door-like fashion. FDS designed the gate for the project. The gate used an black powder coated aluminum frame with Trex Fencing materials to provide privacy and security. The fence runs along the perimeter between other properties and the entrance to Derby City’s gaming facilities and the Churchill Downs horse racing practice track. Luckily, the Trex Fencing experts at FDS were able to design the cantilever gate that met the expectations of Derby City and matched the aesthetic of the Seclusions Fence. After about two weeks, 1,750 ft. of Woodland Brown Trex Seclusions Fencing was installed with the desired cantilever gate. Derby City has expressed great satisfaction in the project’s outcome and can now enjoy the peace of mind of a secure and durable composite fence. As most of the world is finally winding down from the party-filled holiday season, we are still celebrating at Trex Fencing-FDS Fence Distributors! Why? Both Trex and FDS Fence Distributors are celebrating anniversaries in 2019! Trex and FDS have propelled each other throughout the years thanks to the innovation and expertise on both sides. With Trex turning 25 and FDS turning 30, we are very excited by how far we’ve come and want to look back at our journey. FDS Fence Distributors began operations in 1989 as a fencing contractor. Over the years, we expanded our business to service both fence and deck clients. That’s where our relationship with Trex began. Our original company was one of the first contractors to install Trex decking in the Western United States way back in the 1990s, and in the early 2000s, we partnered with Trex to design the Trex fencing system. Over the years, we grew with Trex. Our operations expanded to include materials sales and eventually national distribution. In 2018, our client base grew by over 55% and we expect the growth to continue in our anniversary year. Trex fencing customers can be found in every part of the country! Trex formed in 1996 from a Mobile Corporation business unit specializing in research and development. As an independent company, Trex went public in 1999 (NASDAQ:TREX). Since its beginnings, Trex has sought to innovate the outdoor composite materials industry. It has consistently led with the best products. Even during difficult times when the economy has not been friendly or product issues required resolution, Trex adapted and consistently improved over the years. The company now accounts for 50% of all composite decking sales. And in fencing, Trex’s design and product performance is second to none. Early on, FDS recognized the unique benefits of composite materials as decking boards. FDS installed and advocated for Trex decking as a Trex ProPlatinum installer and regional dealer. When Trex decided to branch out its product line to include fencing, FDS was invited to collaborate with Trex to create the innovative fence. We were adamant that the fence had to meet high expectations in durability, design, and functionality. Trex engineers rose to the occasion and created Seclusions, the fully private fence system. Unlike other composites, Trex has focused on all aspects of a successful fence system, not just the appealing low-maintenance benefit. A fence that doesn’t require regular maintenance but isn’t very sturdy or attractive doesn’t provide full value. Trex Seclusions is popular specifically because it does so much more than competitors that for the most part are either no longer in business or have relegated themselves to economy options through lumber retail outlets. When the Trex Seclusions Fence launched, it made history as the first full composite fence. The unique interlocking picket design, reinforced rails, and durable posts make it exceptionally superior to other fencing systems such as wood, vinyl, and other manufactured materials. 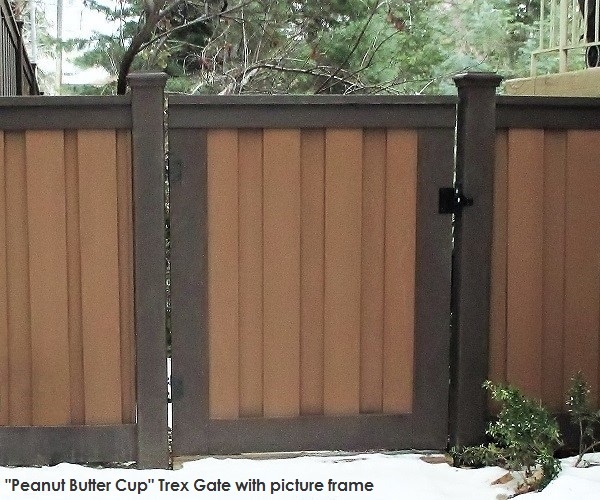 The first Trex Seclusions fence was installed in Provo, Utah in 2005, becoming the poster child for Trex Fencing across their national marketing campaigns. Seclusions continues to set the benchmark today for the successful implementation of innovative product design. To further establish the footprint for the Seclusions fencing product, Trex officially brought on FDS Fence Distributors for national distribution. Trex’s specialty is manufacturing so a partnership made sense. We can reach clients through a special order program that is not sustainable for a large manufacturer. Our partnership has allowed Trex fencing sales to grow by at least 25% year-over-year. Consumers love the ease of ordering the product through our vast network of suppliers and contractors. At only 25 and 30, Trex and FDS respectively have accomplished a lot and become an impressive power couple! The partnership continues to flourish with FDS going on to advance Trex Fencing growth with new additions to the product line including a gate system and, of course, the Horizons Horizontal Fence System. Happy Anniversary to both Trex and FDS Fence Distributors and here’s to many more years of innovating the fencing world! While the Trex Seclusions and Horizons systems are based on specifically configured designs, the fact that the material is not assembled in pre-built panels means a person building a fence has quite a bit of latitude for creativity. Trex is similar to wood in that it can be cut to any length from its original dimensions. That’s why it’s easy to build a fence shorter or taller than the standard 6′ or 8′ tall height. The components can also be used in combination with other materials as we’ve written about in previous posts (such as bamboo fill in between Trex posts and rails). Do you have your own creative design you would like to show off? Feel free to submit it to [email protected]. The wood fence required regular upkeep and was warping and splintering. It’s no secret that Trex fencing is popular as a residential product. Privacy is important to homeowners and Trex fulfills that need perfectly with its completely site-obscuring design. Aesthetics are also important. Discerning owners of private residences choose Trex because there is no other fence like it in design and composition. Many of the reasons that Trex fencing appeals to homeowners also apply to commercial and government property owners. However, there are additional attributes that are particularly relevant to these types of buyers. Trex is a versatile fence that is as diversely functional as it is beautiful. For more details about Trex fencing, please contact us at [email protected]. For more information on Trex fencing for your development, contact us at [email protected]. Maxwell Enterprises, a Georgia fence contractor based in Villa Rica, installed approximately 400 feet of eight foot tall Trex Fencing along the property perimeter for Haynes House, a luxury apartment community in Atlanta. Perimeter fencing in urban environments is useful for privacy and security. It also helps to alleviate street noise. With its fully interlocking picket system and dense composite material, Trex is a perfect fence for urban dwellings. However, it isn’t just functionality that makes Trex appealing. It’s unique design provides an aesthetic contribution to an upscale property. Additionally, over the life of the fence, Trex will weather gracefully whereas traditional wood fences become increasing difficult to maintain as they age. Haynes House is a certified green building project. Trex is used increasingly in urban green building ventures. Whether or not the U.S. Green Building Council’s LEED point system is a part of a specification, Trex products provide sustainable and resilient solutions for environment-friendly initiatives. Trex fencing has the highest recycled content of any wood-plastic composite: 95% of the material in Trex comes from reclaimed sources. For more information on this particular project, contact Jay Jones at Maxwell: 770-362-0090. Horizontal fencing has become popular as a design alternative to traditional fencing with vertically-oriented boards. Among the horizontal fence options, the Trex Horizons horizontal fencing system’s design is unique. Like Seclusions, Horizons utilizes an interlocking picket system which provides full privacy and a board-on-board appearance. Horizons horizontal fence also provides a modern appeal with its black, powder-coated steel frame. If you are looking for a horizontal fence that still offers a sight-obscuring benefit and without unattractive back framing, Trex Horizons is your fence. Both Seclusions and Horizons are stick-built systems which provides adjustability for height and width. Additionally, they are both easy to build either in a stair-stepping or a sloping manner. For Horizons, the frame rails and horizontally-oriented pickets can be cut to accommodate angles if sloping is the preferred method. If you choose to stair-step, you may want to use longer posts to give you the necessary transitions in height. Our 12 ft. long posts provide plenty of length for those scenarios (they also allow you to build a Horizons fence up to 8 ft. tall and still have plenty of post length to put into a stable footer in the ground). Have questions about Trex Horizons fencing? Feel free to contact us for more details. We are pleased to announce the completion of yournextfence.com. This new site is designed to take your Trex Fencing experience to the next level. In the coming months we will be releasing more DIY tutorials, project spotlights, photos, tools, and resources for homeowners, contractors, architects, and other community and building professionals.